When I cook whole grains I always make more than I need for the meal I’m preparing so that I can have extra for breakfast and/or lunch the next day. Whether it be brown rice, amaranth, quinoa, millet, oats, or farro, my morning routine almost always includes a whole grain porridge. Otherwise I’m ready to gnaw my own arm off by 11am and that’s not good for anyone. Hot summer days make it particular difficult to have hot porridge, but we’ve been having a rather odd summer with uncharacteristically cooler temperatures and a lot of rainy days, making porridge a perfectly comforting breakfast option. 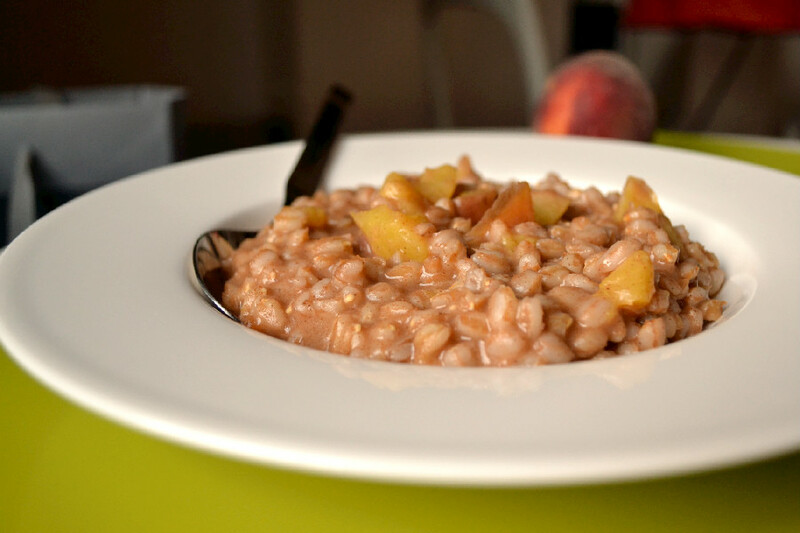 The version pictured here makes great use of leftover Farro and seasonal peaches. In the autumn/winter, you could replace the peaches with apples, pears or other local seasonal fruits. Here’s the recipe if you’d like to try it. Recipe and Photography by Nissrine @ Harmony à la Carte. This porridge recipe makes great use of leftover Farro and seasonal peaches. A touch of cinnamon adds a wonderful aroma and an earthy flavour that will wake up your taste buds. 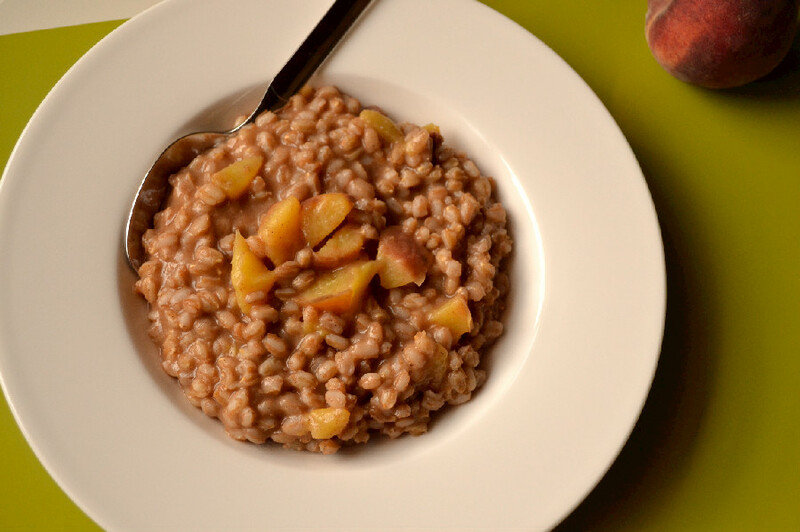 Combine farro, water and peach pieces in a small pot over medium heat and bring to a boil. Add cinnamon and stir to combine. Reduce and let simmer, uncovered, until water has been absorbed. Stir frequently to prevent sticking. Drizzle with maple syrup and serve hot! Note: If you can’t get Farro, Barley is the closest substitute in terms of texture. The recipe could work with any other whole grain as well, but you’ll get a different taste and texture. If you’d like to read more about Farro, see this post. For other porridge recipes, follow this link.